I am not saying that ‘petroleum-refinery-external-enzymefacilitated- platform-high gravity-brewed beers’ are bad, nor that it is an unethical way to brew them. All I’m asking is: can you still sell them as something entirely different? And can we still, as the globally united community of beer professionals and beer lovers, in honesty tell our consumers that brewing is fundamentally the same whether is happens in a mega-brewery or in a home-built and hand-operated nano brewery? Unlike the petroleum, pharmaceutical, detergent or dairy industries, ours is one where we cannot ignore this question. Anders Kissmeyer in Scandinavian Brewers’ Review on Heineken’s plans to make their breweries look and perform like petroleum refineries. Lots of new stuff from the Norwegian micros now, particularly from Ægir. Seems like the contract brewing of some of their bottled beers has freed the capacity for a broader range of beers on keg and cask, which was just the intention of brewer Evan Lewis. Currently doing the rounds is the Ægir Saison, which used to be available only at the brewpub. There is also an Ægir Wit. On the mini festival this Saturday at Grünerløkka Brygghus, Oslo, there are opportunities to sample Harvest ale and Altbier. Finally, during the cask festival in Oslo, there will be cask versions of the IPA, Blonde, Rakøl ( a new one) and Saison. Plus bottles of the new Natt Imperial Porter. My last post about Italy was perhaps a bit pessimistic, but I think the comments show that it is an issue worth considering. Anyway, I have positive things to report as well. On my visit to Rome last year, I had the pleasure of visiting both branches of Johnny’s Off Licence and brought home all I could carry. This year, I travelled with family and friends, and I picked a hotel for convenient access to the historical sights, so initially I was a bit worried that I would not be able to do any beer shopping. A look at the map showed that was within walking distance from the Open Baladin bar, but I did simply not have the time to go there. I did not get to any of Johnny’s beer shops, either – and I did not really need to. Just five minutes away from the hotel was the newly opened Domus Birrae, which gave excellent opportunities both for stocking up on chilled beers to consume at the hotel plus as much I could fit into my luggage. The shop has two main parts. The front room has a row of refrigerators with a stunning range of Italian micros. And the focus is exclusively on Italian craft beers. The only exceptions I could find were two canned beers from a micro in Switzerland. The Italian-speaking part of Switzerland, that is. In addition there is the back room, with long rows of shelves. I don’t know how many, but several hundreds for sure. Friendly and enthusiastic staff who are very happy to give advice, they really know their stock. Among the beers I enjoyed most were evo from Birrificio Barley, Maltus Faber Imperial, several beers from Pausa Cafe, a barrel aged version of the lambic from Panil… But that does not matter so much. You tell them what you like, and they are happy to recommend something that will suit you, often from a brand new brewery. So, if you find yourself thirsty and tired after visiting the Colosseum, this oasis is only ten minutes away. The adress is Cavour 88, just up the road from the Cavour Metro stop. It easily made it into my top ten of beer shops. The price range was moderate for Italy, sure the more exclusive items were expensive, but there was something for almost very wallet here. Or Gasthäuser, inns, pubs with a few rooms to let. Any recommendations? Italian beers – basic commodity or luxury item? I promised you some reflections from Italy, didn’t I? So, there I was, in Terracina, midway between Rome and Naples, a place not picked for any beery connection. I had searched the web beforehand for Birra Artiginale and so on, without much success. 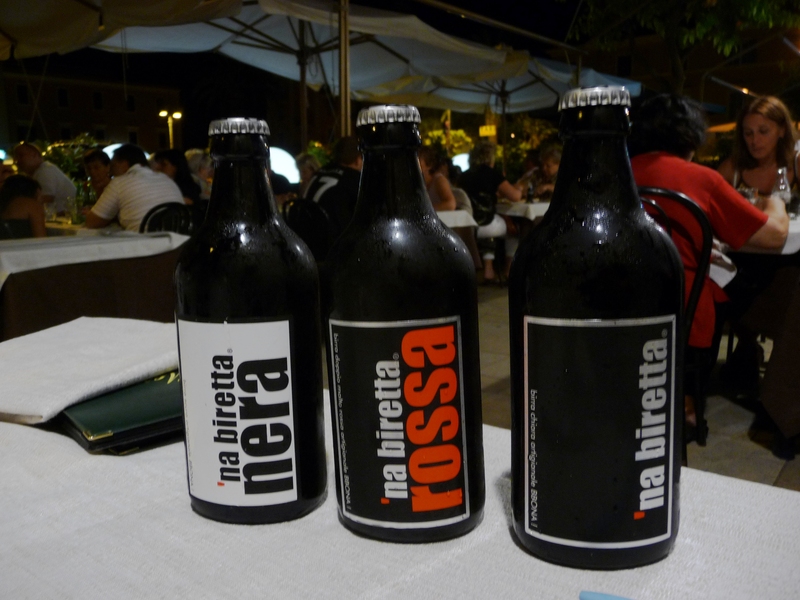 I found a cafe/restaurant on Facebook which boasted of the ‘na birretta beers from Birradamare. 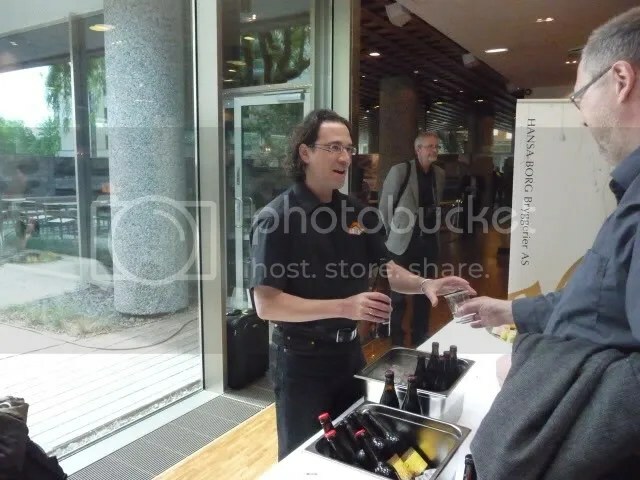 They had three of them, as well as a few other Italian and Belgian craft beers. The ‘na biretta beers were quite all right, far better than Italian macros, they have a stylish packaging, but they would by no means stand out in a country where there is a consistently high quality in the market. They were moderately priced – 3 Euros per bottle if I remember correctly. A pub next door had five of the Belgian Gordon’s beers on tap. This is a case of clever marketing. These beers tend to be sold very cheap nearer to their country of origin, but there are no laws saying the same product could not appeal to tramps in Brussels as well as bright young things in Southern Italy. No sign of any interesting beers in any of the shops. But in the upmarket restaurants, there were quite a few. I saw comprehensive beer lists in at least two of them, including the one who had excellent steaks and boldly called themselves the best restaurant in town. A page of the menu was set aside for craft beer, but the prices were high. A bottle of good local wine was from € 12 upwards, a bottle of craft beer started at €15. The problem is that does not only include sophisticated barrel aged wonders. The wheat beers, the brown ales and pilsners were also in the same price bracket. Sure, I am prepared to pay extra for high quality. But, however much loving care you put into a bottle of Wit or Weiss, it is a humble drink, meant to quench the thirst and be used as an everyday tipple. We are talking about beers that would cost 50 cents a bottle in Germany. Is this sustainable? I don’t think so. Sure, I get the point about high taxes and obstacles for Italian brewers. But it is absurd if Italian beers should cost twenty times the price of a similar bottle in Germany. If you want premium prices, you need to go for the premium end of the market, too. But, for a while, you might have a snobbish appeal. Ole Petter Wie, the manager of Carlsberg-owned Ringnes brewery, by far the biggest actor on the Norwegian beer market, has ambitions. Big ambitions. He wants the profits margins to increase from 10 per cent today to 15 per cent in a few years. 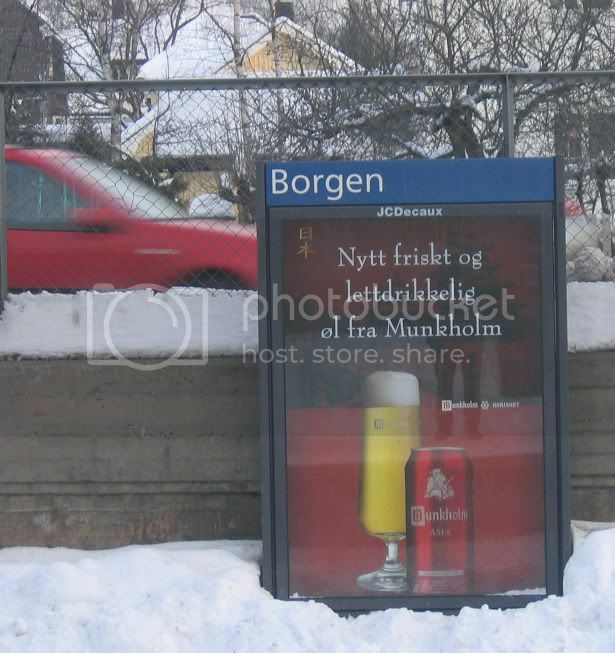 He boldly proclaims in an interview with Dagens Næringsliv (not online) that he aims to introduce 40-50 new types of beer and soft drinks while removing brands with low sales or low margins. The woman segment. A number of new beers to make women choose beer instead of wine and cocktails. Some of those will be imported, others will be brewed in Norway. Super premium beers. Sales of beers in the upper price and quality level constitutes five per cent of the market today. Import beers dominate this. Wie says Ringnes wants to increase the share to ten per cent. This segment leads to increased beer consumption and is very profitable, both for the sales outlets and for us. So. what do I make of this? Dozens of new beers sounds fine, but I fear this will be more of the same. We have already seen the first of the imports. Three Brooklyn beers (the most mundane of the lot), Stella, two types of Leffe. While the smaller players are importing craft beers from around the world right under their noses, the marketing men of the big players seem to think that super premium means more pale lagers in fancy packaging. As for the alcohol free beers, they tried to launch six of them about five years ago. They sank without a trace. The female segment? With an advertising ban, it’s hard to move into new markets. I suspect there will be more soft lagers in fancy bottles again. No reason for the guys at Nøgne Ø top lose any sleep over the Ringnes strategy! There is no lack of articles about the decline and fall of the English pub, but there are changes in other countries, too. I have written about the positive developments in Oslo concerning the ability of craft beer, but at the same time, obviously, the volume of standard pale lager is declining. The Norwegian journalist trade paper reminisces about the good old days when the hacks used to meet up for a pint a two after work. Some of them on Fridays, some more or less every day. Nowadays, one it is more common to meet a colleague for a spinning session before work than to meet up over a beer in the evening. Going into a local after work – at least where I am, away from a big city and in a small town – feels more wrong than right, more anti-social than social. The chaps at the bar have been there too long, it’s almost empty, it’s a realm of misbehaviour – drinking is bad for you, didn’t you know? And walk into a local pub and take a look around – there won’t be many people in their early 20s just sitting there and enjoying a beer. Call me bigoted, but if there are some then they aren’t likely to be the sort of guys who you’d feel comfortable socializing with, are they? No need to worry. I am not likely to turn this into a spinning blog any time soon.